January 25, 2018, in the Basilica of Saint Paul Outside-the-Walls. Pope Francis' celebration of the Second Vespers of the Solemnity of the Conversion of Saint Paul the Apostle, at the end of the 51st Week of Prayer for Christian Unity, on the theme: Powerful is Your Hand, Lord (Cf. Exodus 15:1-21). 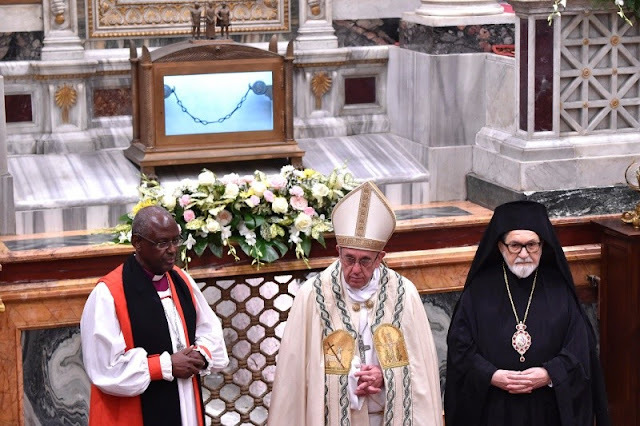 The Reading is taken from the Book of Exodus, which speaks of Moses and Mary, brother and sister, who raise a hymn of praise to God on the shores of the Red Sea, together with the community that God has liberated from Egypt. They sing their joy because in those waters God has saved them from an enemy that was determined to destroy them. Previously, Moses himself was saved from the waters and his sister witnessed the event. In fact, Pharaoh had commanded: ”Every son that is born to the Hebrews you shall cast into the Nile” (Exodus 1:22). Instead, having found the basket among the reeds of the Nile with the child inside, Pharaoh’s daughter named him Moses, because she said: “I drew him out of the water!” (Exodus 2:10). The story of the rescue of Moses from the waters thus prefigures a greater rescue, that of the entire people, which God had made pass through the waters of the Red Sea, then pouring them over their enemies. Many ancient Fathers interpreted this liberating passage as an image of Baptism. It’s our sins that have been drowned by God in the living waters of Baptism. Much more than Egypt, sin threatened to make us always slaves, but the strength of divine love engulfed it. Saint Augustine (Sermon 223E) interprets the Red Sea, where Israel witnesses the salvation of God, as anticipatory sign of the Blood of Christ crucified, source of salvation. All of us Christians have passed through the waters of Baptism, and the grace of the Sacrament has destroyed our enemies, sin, and death. Coming out of the waters, we attained the freedom of children; we emerged as a people, as a community of saved brothers and sisters, as fellow citizens of the saints and members of the household of God” (Ephesians 2:19). We share the fundamental experience: the grace of God, His powerful mercy in saving us. And precisely because God has wrought this victory in us, we can sing the praises together. In life, we then experience the tenderness of God, who in our daily life saves us lovingly from sin, from fear, and from anguish. These precious experiences are kept in the heart and in the memory. However, as it was for Moses, the individual experiences are linked to an even greater history, that of the salvation of the people of God. We see it in the song intoned by the Israelites. It begins with an individual story: The Lord is my strength and mysong, and He has become my salvation (Exodus 15:2). However, it becomes immediately the narrative of the salvation of all the people: “Thou hast led in thy steadfast love the people whom thou hast redeemed” (v. 13). He who raised this song realized he was not alone on the shore of the Red Sea, but was surrounded by brothers and sisters who received the same grace and proclaim the same praise. Also, Saint Paul, whose conversion we celebrate today, had the powerful experience of grace, which called him to become from a persecutor to an Apostle of Christ. God’s grace also drove him immediately to seek communion with other Christians, first at Damascus and then at Jerusalem (Cf. Acts 9:19.26-27). This is our experience as believers. As we go growing in the spiritual life, we understand ever better that grace comes to us together with others and is to be shared with others. So, when I raise my thanksgiving to God for what He has done in me, I discover I don’t sing alone because other brothers and sisters have my same song of praise. The various Christian Confessions have had this experience. In the last century, we finally realized we found ourselves together on the shores of the Red Sea. We were saved in Baptism and the pleasing song of praise, which other brothers and sisters intone, belongs to us because it’s also ours. When we say that we recognize the Baptism of Christians of other traditions, we confess that they also have received the Lord’s forgiveness and His grace, which operates in them. And we accept their worship as genuine expression of praise for what God accomplishes. So we wish to pray together, uniting our voices even more. And even when differences separate us, we acknowledge that we belong to the redeemed people, to the same family of brothers and sisters loved by the one Father. After the liberation, the chosen people undertook a long and difficult journey through the desert, often vacillating, but drawing strength from the memory of the salvific work of God and of his ever close presence. Christians of today also find many difficulties on the way, surrounded by so many spiritual deserts, which make hope and joy dry up. On the way there are also grave dangers, which put life in jeopardy: how many brothers today suffer persecutions in the name of Jesus! When their blood is shed, even if they belong to different Confessions, they become at the same time witnesses of the faith, martyrs, united in the bond of the baptismal grace. Together with friends of other religious traditions, Christians also face challenges today that demean human dignity: they flee from situations of conflict and poverty; are victims of the trafficking of human beings and of other modern slaveries; they suffer hardships and hunger, in a world ever richer in means and poor in love, where inequalities continue to increase. However, as the Israelites of Exodus, Christians are called to guard together the memory of all that God has accomplished in them. Reviving this memory, we can sustain one another and face — armed only with Jesus and the gentle force of His Gospel –, every challenge with courage and hope. Brothers and sisters, with the heart full of joy for having sung today here together a hymn of praise to the Father, through Christ our Saviour and in the Spirit that gives life, I wish to express my affectionate greetings to you: to His Eminence the Metropolitan Gennadios, Representative of the Ecumenical Patriarchate; to His Grace Bernard Ntahoturi, personal Representative in Rome of the Archbishop of Canterbury, and to all the Representatives and Members of the various Christian Confessions gathered here. I am happy to greet the Ecumenical Delegation of Finland, which I had the pleasure of meeting this morning. I also greet the students of the Ecumenical Institute of Bossey, on a visit to Rome to deepen their knowledge of the Catholic Church, and the Orthodox and Eastern Orthodox young people who study here thanks to the generosity of the Committee of Cultural Collaboration with the Orthodox Churches, which operates in the Pontifical Council for Promoting Christian Unity. We thanked God together for what He has accomplished in our lives and in our communities. We now present to Him our needs and those of the world, trusting that He, in His faithful love, will continue to save and to accompany His people on the way.